A couple weeks ago, my boyfriend won a gift certificate to an Irish pub in my hometown. This may be entirely the only reason why I came to be eating at an Irish pub that I’d never been to before, even though it’s been in my hometown for… a while. Regardless, the food was fantastic. He had meat and potatoes something. I had Shepard’s Pie, which came with a slice of Irish soda bread. And that is where this entire cooking fiasco started. I’d heard about Irish soda bread before. Something about a bread that’s really easy to make because it doesn’t require yeast. Actually, I don’t think I really got it until I ate it. I knew it had baking soda in it, but it didn’t occur to me until I was eating it that its… bread that uses baking soda as leavening. Anyways, the bread was delicious, and I immediately decided I wanted to make some. Fast forward a couple of weeks. Dinner had been late and lazy for a while, and I’ve been feeling like I want to cook more. I get the impression that nobody has plans, so I ask my parents if they have anything they’re interested in and intend to cook it. No suggestions, except the one from my own stomach – the realization that, every time I smell dinner cooking, I start hoping it’s meatballs. I’m already planning on making soda bread that day, so I figure I can throw together some pasta and meatballs as well. Getting ahead of myself here. Bread first! 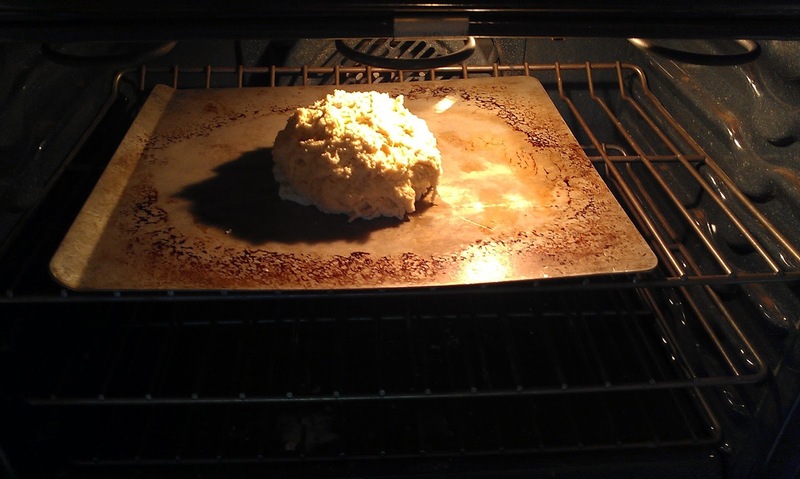 Soda bread is really easy. Sorta. Apparently, American Irish soda bread is more of a dessert bread – with sugar and fruit and things to make it sweet and more palatable. That’s not what I wanted. I wanted bread. So I found a recipe in from the New York Times that offered just that. 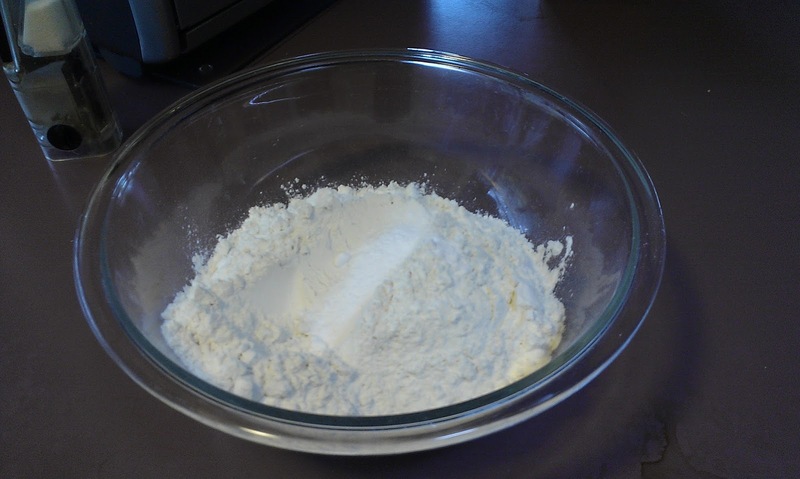 Basically, flour, baking soda, salt, and buttermilk. Mix the dry ingredients, add buttermilk. I didn’t feel like making butter or anything this time, so I went ahead and just purchased buttermilk. 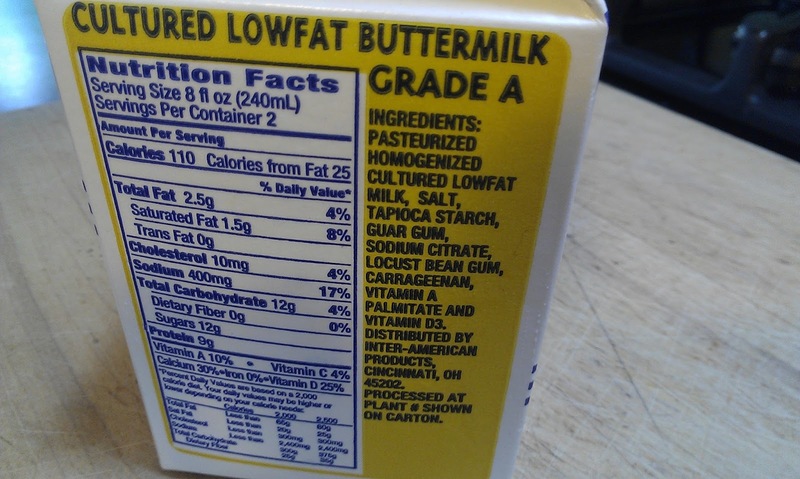 Reading the ingredients on my buttermilk, however… I think I’ll stick to making it in the future. Carrangeenan is a fun word to say, though. 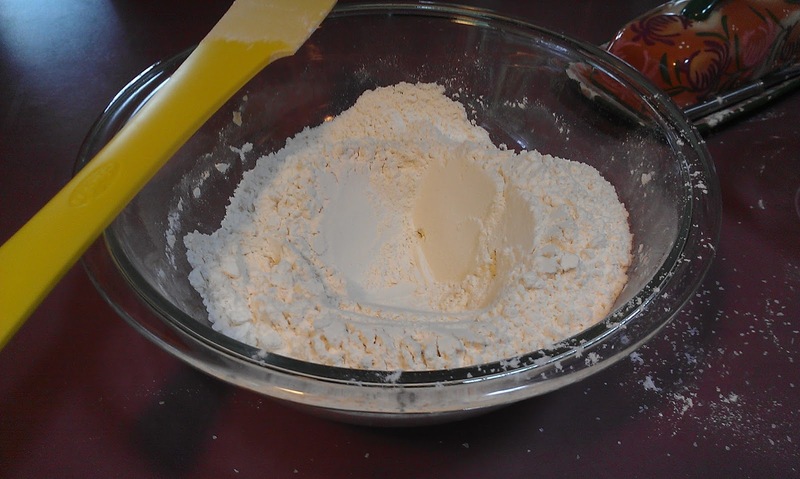 The standard technique for mixing dry and wet ingredients is to make a well in the center of the dry ingredients and then add the wet to the well, and slowly mix. Naturally, my well is never big enough and the wet ingredients always overflow. Which is fine in a bowl, but once, I was making bread on the counter, and my dad just kept pouring the wet ingredients even after the overflowing happened… then we got to clean egg off the floor. The bread mixed okay, but it was a little wet which made it hard to form nicely. Lots of sticky-outty parts where my hands stuck to the dough while forming. Now I’m going to pause my discussion of bread making. 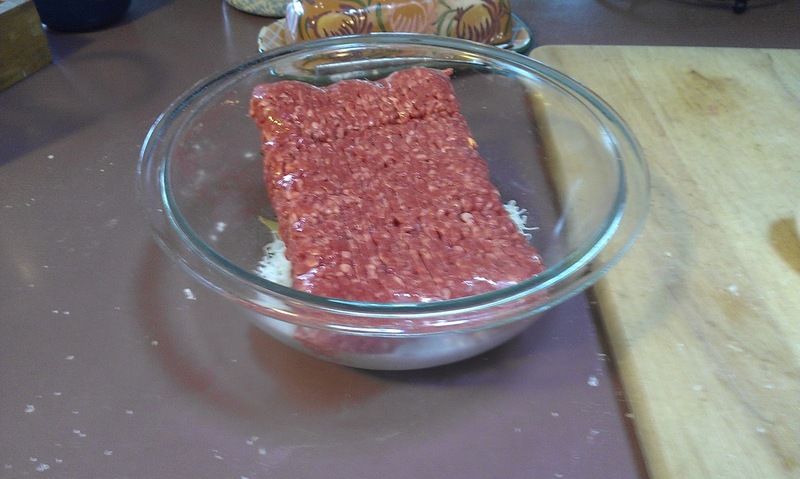 Once I put the bread in the oven, I went and found a meatball recipe. It was even Irish meatballs, because… well actually, it was the best one I found. Looked tasty, and I had all the ingredients on hand already (yes, even the Panko breading. Probably got 1.5 boxes of that stuff in the cupboard for some reason). 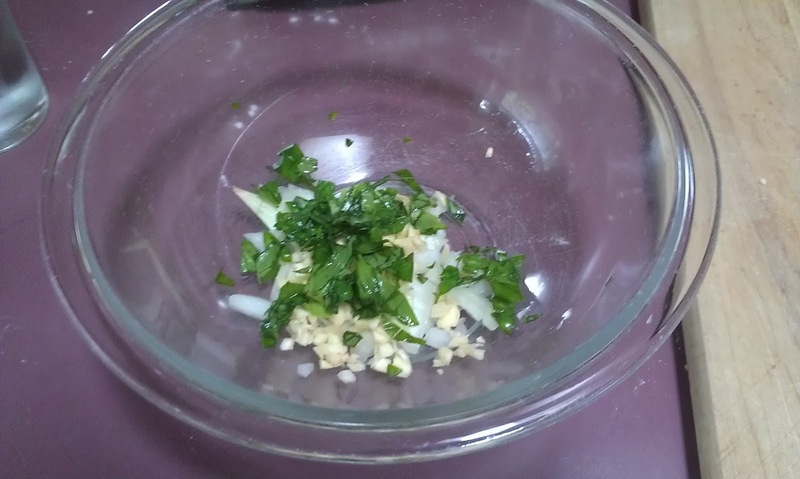 So I went to gather the ingredients, only to discover, to my horror, that I was wrong. I didn’t have all the ingredients. Usually, I would respond to this by just omitting the missing ingredient, or finding a substitution… but when you’re making meatballs, it’s pretty hard to omit or substitute out… the meat. The store is close, though, so I just checked how much longer the bread needed to be in the oven for… and, as it turned out, I hadn’t set a timer either. But it definitely hadn’t been in for the full time, so I figured I was safe if I just took it out when I got home. 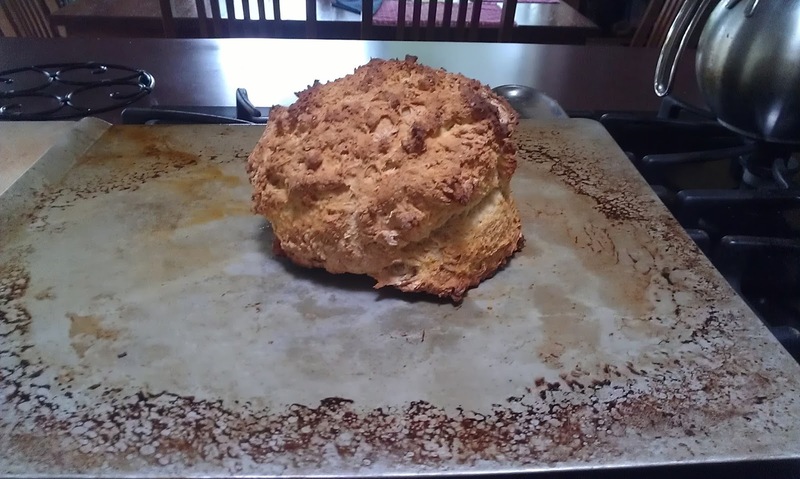 Slightly overcooked but still mostly delicious Irish soda bread. Also, totally formless and I think this gets a score of “not yet perfect, try again”. Hm, I should implement a scoring system on my blog, on a scale from “never again” to “never change”. 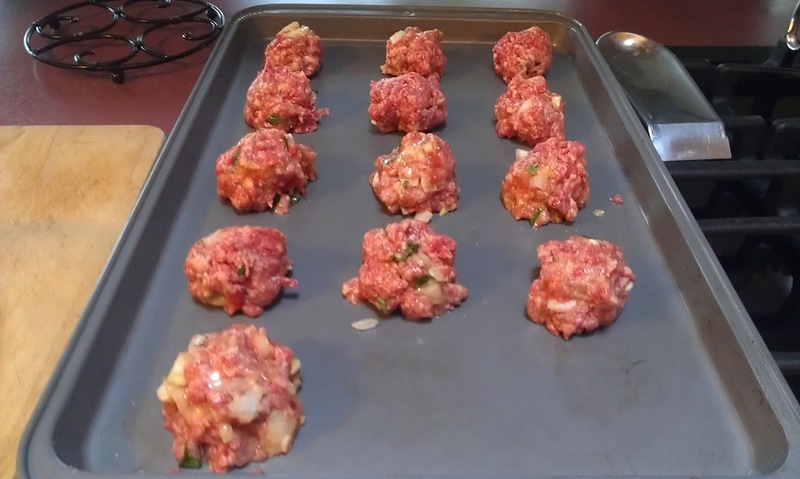 Now that I was much further behind schedule than I’d wanted, I started making meatballs. Basil, garlic, onions, things that taste good with meat and pasta sauce, basically. Then, meat. I halved the recipe because who really wants to be serving 40 meatballs to 3 people. Even a pound of meat seemed excessive, but I figured I’d go for it, and besides, the recipe called for 2 eggs and I like to avoid halving eggs. As per the recipe, I mixed the meat and everything else but the eggs together, then added 2 eggs and mixed that. 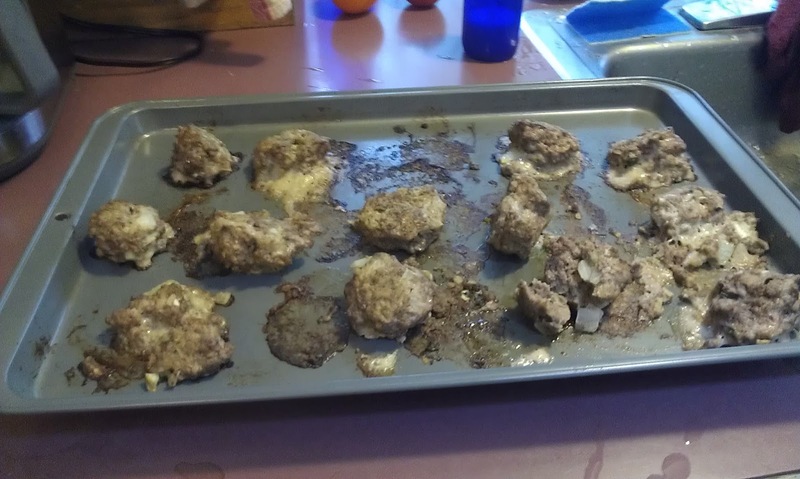 When I started forming the meatballs, they ended up large, so I only made 13 instead of the expected 20… they also ended up really soggy. Like… really soggy. The last few I pulled out of the bowl were so saturated with egg that it was more like an egg ball with meat added than a meat ball with egg. No matter though. I carried on through the strangeness. They all got plopped on a pan and popped in the oven. I realized my mistake when I went to “shake the pan so meat browns on all sides”, as per the recipe. They didn’t shake, that’s for sure. When I prodded with the spatula, they mostly just fell apart (as you can see from the final, cooked picture). Wondering what I did? Go back and reread the paragraph next to the picture of meat. I halved the recipe, which called for 2 eggs. Then added 2 eggs. I got extra eggy meatballs. I suppose this kind of thing is the cause of most of my kitchen disasters (doubling only the butter and sugar in cookies, etc). And the meatballs were still delicious, especially on a pile of pasta and red sauce with a side of soda bread. An unconventional dinner, but it worked, and I loved it. I’d definitely make these meatballs again… perhaps with the right amount of egg next time.